Clarksville and Ozark and Van Buren and Fort Smith on 64, and there’s an end of Arkansas. And all the roads into Oklahoma City, 66 down from Tulsa, 270 up from McAlester. 81 from Wichita Falls south, from Enid north. Edmond, McLoud, Purcell. 66 out of Oklahoma City; El Reno and Clinton, going west on 66. Hydro, Elk City and Texola; and there’s an end to Oklahoma. 66 across the panhandle of Texas. Shamrock and McLean, Conway and Amarillo, the yellow. Wildorado and Vega and Boise, and there’s an end of Texas. Tucumcari and Santa Rosa and into the New Mexico mountains to Albuquerque, where the road comes down from Santa Fe. Then down the gorged Rio Grande to Los Lunas and west again on 66 to Gallup, and there’s the border of New Mexico. And now the high mountains. Holbrook and Winslow and Flagstaff in the high mountains of Arizona. Then the great plateau rolling like a ground swell. Ashfork and Kingman and stone mountains again, where water must be hauled and sold. Then out of the broken sun-rotted mountains of Arizona to the Colorado, with green reeds on its banks, and that’s the end of Arizona. There’s California just over the river, and a pretty town to start it. Needles, on the river. But the river is a stranger in this place. Up from Needles and over a burned range, and there’s the desert. And 66 goes on over the terrible desert, where the distance shimmers and the black center mountains hang unbearably in the distance. At last there’s Barstow, and more desert until at last the mountains rise up again, the good mountains, and 66 winds through them. Then suddenly a pass, and below the beautiful valley, below orchards and vineyards and little houses, and in the distance a city. And, oh, my God, it’s over. In addition to the obvious musical delight that Steinbeck takes in the sound of the place names listed in the quote above, the fact that he names so damn many of them serves another purpose, which is to give the reader a sense of how epic the journey is that the characters in the novel have undertaken. The names of those places trace the journey of the Joad family from Oklahoma to the supposed promise land (thank God, at last) of California. The sheer number of those place names and the fact that they’re all connected by Highway 66 gives the reader a sense of what life was like on the road in the 1930s (twenty years before Jack Kerouac). 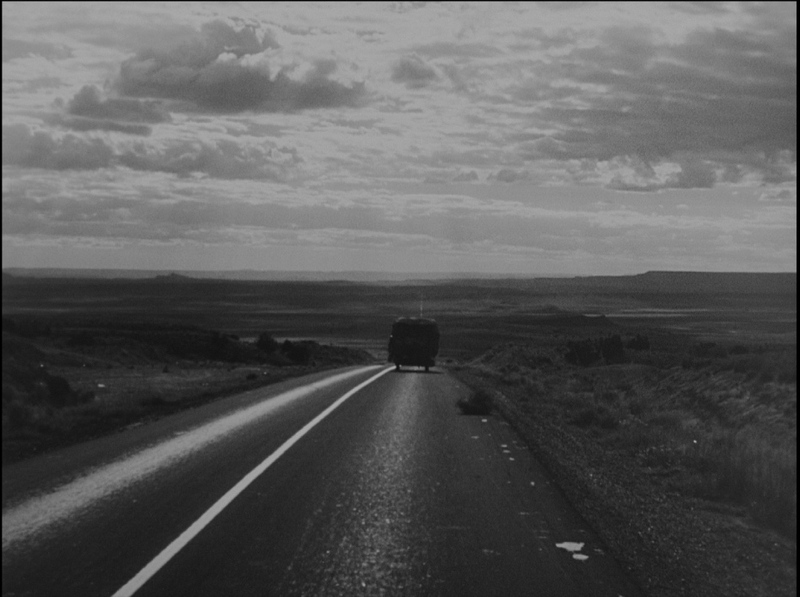 It is pure Americana, pure Steinbeck and, when that prose is translated into images, it is also pure John Ford. The Grapes of Wrath was published in the spring of 1939. Shortly thereafter, Daryl Zanuck, Vice President in Charge of Production at Twentieth Century Fox, bought the rights and, incredibly, production of the film wrapped in November of that same year, about six months after the novel was published. (Needless to say, things got done a little quicker in Hollywood back in those days.) It was a courageous decision for Zanuck to produce Grapes; the novel was instantly controversial upon publication. 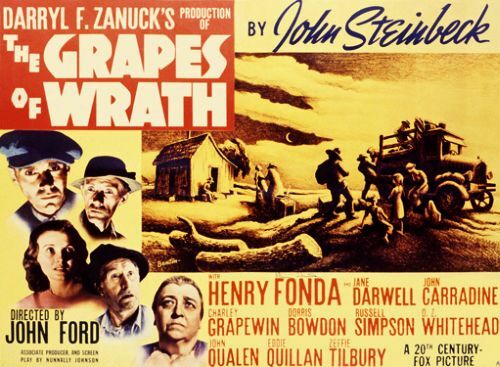 It was banned and burned in various places around the United States and this controversy carried over to the film’s production: the California Chamber of Commerce and the Agricultural Council of California called for a boycott of all Fox films upon hearing that Zanuck was making an adaptation of Steinbeck’s novel. When Zanuck sent a second unit director on the road to shoot semi-documentary footage of the Joad’s jalopy out on the highway, they used a dummy title, Highway 66, so that no one would know what they were really shooting. Another potential obstacle for Zanuck was Chase National Bank, which was the primary stockholder of Twentieth Century Fox. This is because The Grapes of Wrath took an explicitly pro-labor, anti-capital stance. If there are villains in The Grapes of Wrath, they are the banking interests who are responsible for kicking the farmers off their land, which is what sets the plot in motion. That these bankers are faceless and unseen is part of the point Steinbeck (and, in the movie version, John Ford) are trying to make about capital. There’s a powerful scene early in the film where a poor farmer, Muley Graves (John Qualen), confronts a bank representative who tells him that his farm will be reposessed. The bank employee points out that he’s just doing what he’s been ordered to do and that he’s being paid by someone hundreds of miles away. “Then who do we shoot?,” Muley asks in frustration. When it came time for Zanuck to assign a director to the film, John Ford was the most logical choice. Ford was a proven critical and commercial force in Hollywood at that time, having recently won an Oscar for Best Director for The Informer and having directed a series of hits for Fox, including the terrific Shirley Temple vehicle Wee Willie Winkie. More importantly, Zanuck knew Ford had an affinity for the material. Zanuck himself was a conservative Republican, which makes his decision to produce the movie all the more remarkable. Zanuck, however, was also smart and fair and he didn’t have a problem producing films that espoused beliefs that were opposed to his own. Zanuck actually hired a detective agency to investigate the labor camps in California like the ones portrayed in the book to see if the conditions were as bad as what Steinbeck had claimed. The agency reported back to Zanuck that the conditions were actually worse than what was in the novel. Zanuck then gave Ford free reign to make the film as brutally realistic as he could. At this stage of his career, Ford’s politics were unambiguously liberal. (After the war they would become a complicated mixture of liberal and conservative but in 1937 Ford had described himself as “a definite Socialist Democrat, always left.”) Ford supported liberal causes throughout the 1930s, such as the Hollywood Anti-Nazi League, and had sent money to anti-Franco forces during the Spanish Civil War and to charities that supported displaced migrant farmers like the Joads. He was also one of the founding members of the Screen Director’s Guild, a union that was initially extremely unpopular with studio executives. Zanuck was willing to overlook his disagreements with Ford because he knew that Ford was the best person for the job. For his part, Ford was excited to receive the assignment. He later said that he “bucked to do it” and that he put everything he had into it. How seriously Ford took the project can be ascertained by his approach to the visual style; Ford hired the best cinematographer in Hollywood, Gregg Toland, to shoot the film. What Steinbeck referred to as the “documentary” feel of the movie was a conscious strategy employed by Ford and Toland. This semi-documentary style is a perfect visual correlative for Steinbeck’s semi-journalistic prose (the novel had its origins in a series of newspaper articles that the author had written about labor camps in the mid-1930s). In particular, Ford and Toland intended to reproduce the style of Depression-era photographers like Dorothea Lange and government-produced documentary films like The Plow That Broke the Plains. 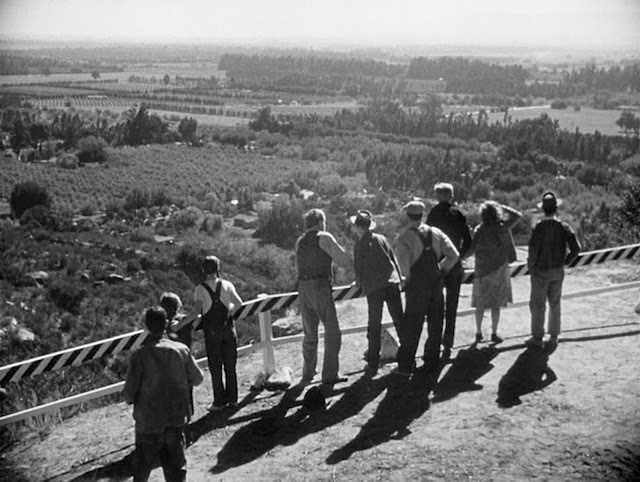 This documentary influence is most notable in the sequence where the Joads first arrive at the first labor camp in California. In one of the greatest shots that Ford ever composed (which is saying a lot), he shows a harrowing scene from the Joads’ point-of-view as their jalopy enters the camp. In the background of the frame, one can see the primitive shacks where the workers are living in total squalor while, in the foreground, the workers slowly drift across the frame, staring directly into the camera with almost accusatory looks on their hard, unforgettable faces. 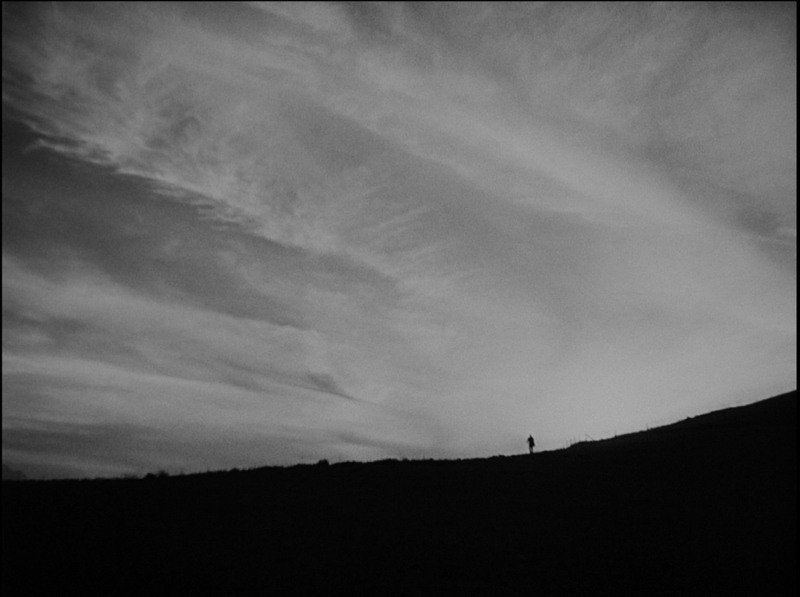 It is one of the most haunting, powerful and mysterious shots of any Hollywood movie of the era. I’m happy to report that these are qualities that come thrillingly alive like never before on Fox’s new Blu-ray of the film, the best it has ever looked on home video. This is not merely a straightforward high-definition rendering of existing source materials (like Warner Brothers’ Blu-ray of Fort Apache from earlier this year) but a high-definition transfer of a full-on digital remastering of the movie. 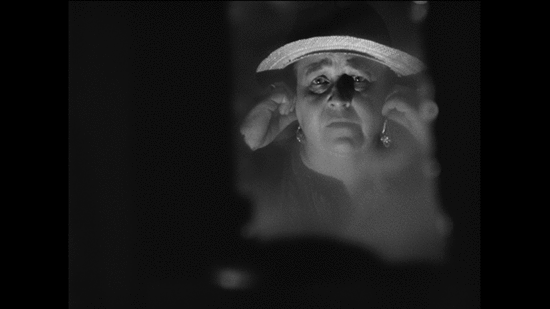 The Grapes of Wrath is a very dark film and this transfer boasts the impressive richness of film-like black levels while also showing an incredible level of detail: every wrinkle on every characters’ face seems visible, which really brings out the film’s documentary side. 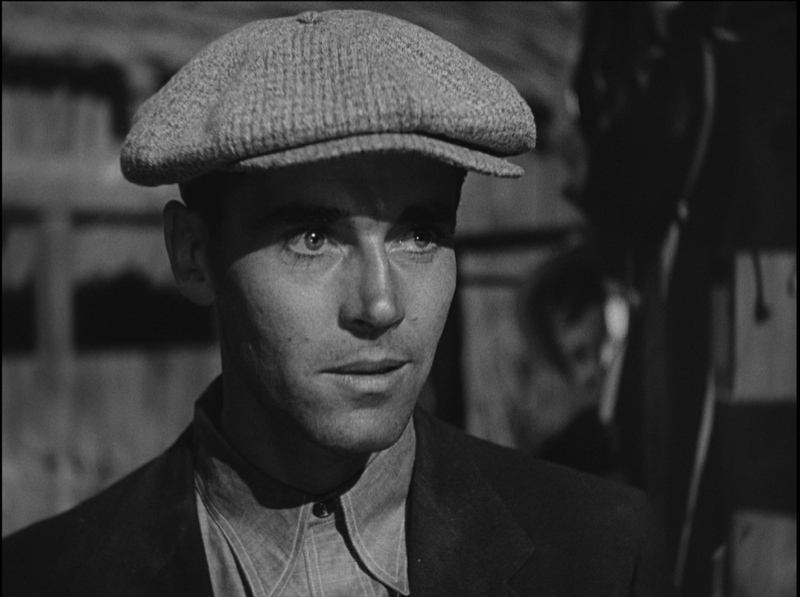 In addition to the visual style, the other most noteworthy aspect of The Grapes of Wrath is Henry Fonda’s lead performance as Tom Joad, the role that the actor was born to play. Fonda’s persona was one that embodied honesty, fairness and liberal idealism, qualities that made him one of the biggest stars of the New Deal era (and qualities that Sergio Leone intentionally and cleverly subverted by casting Fonda as a sadistic and pro-capital villain in Once Upon a Time in the West nearly thirty years later). The scenes where Tom Joad serenades his Ma to the tune of “Red River Valley” and, later, gives the famous “I’ll be there” monologue are unforgettable mainly because of what Fonda brings to the table. Not only is it impossible for me to imagine anyone else playing this role, I am incapable of reading the novel without hearing in my mind the flat, midwestern accent and distinctive cadences of Fonda’s speech in every one of Tom Joad’s lines. Speaking of which, that accent comes through loud and clear in Fox’s DTS-HD Master Audio mono soundtrack. While most mono soundtracks from Hollywood’s golden age sound understandably limited on a surround sound set-up, the audio on this Blu-ray might be superior to any other transfers I’ve ever heard of movies from this era. This is perhaps because the original mono soundtrack itself is brilliant, offering surprising depth and complexity in the mix of the distinctive speaking voices of Ford’s stock company (Jane Darwell, Charley Grapewin, John Carradine, et al), sound effects like wind rustling through leaves and birds tweeting, and, of course, the mournful, indelible strains of Danny Borzage’s accordion. The bottom line: The Grapes of Wrath is an American masterpiece and one of the best films John Ford made before his post-war mature period. The Fox Blu-ray, which exceeded my expectations, is worthy of the movie and will certainly figure prominently in my end-of-the-year “Best Home Video Releases” list. 1. McBride, Joseph. Searching for John Ford: A Life. New York: St. Martin’s, 2001. Print.